Every time I publish a top neighborhoods report for the Tallahassee real estate market, I get comments and email from readers who point out the different way that Southwood and Killearn Lakes Plantation are tracked. 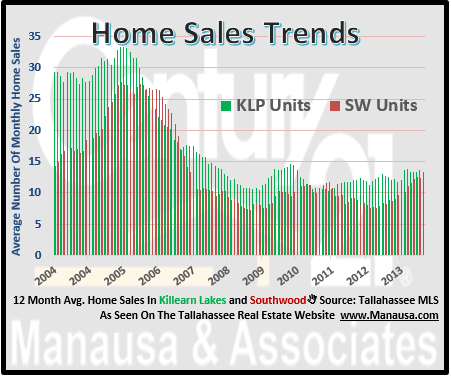 They correctly observe that all the home sales in Southwood are reported in the "Southwood" neighborhood, whereas many of the Killearn Lakes Plantation home sales are reported in other neighborhoods (such as Golden Eagle Plantation, Deerfield Plantation, Glen At Golden Eagle, etc.). So today I figured we would compare the two most active neighborhoods in Tallahassee without all the sub-subdivisions to show a true comparison of both these popular places to live in Tallahassee. 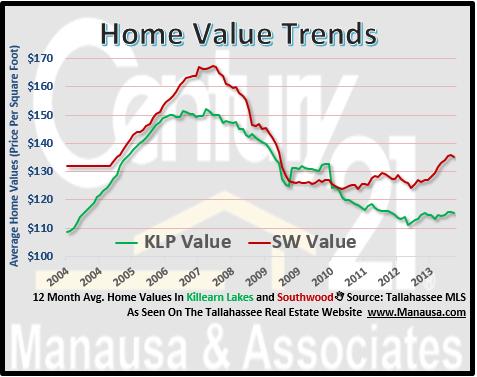 The average number of home sales each month are plotted in green for Killearn Lakes Plantation and red for Southwood. This shows that Killearn Lakes is indeed the most active neighborhood in our market, though Southwood is a close number 2. But home values are a completely different thing altogether. Again, Killearn Lakes Plantation is shown in green, while Southwood is shown in red. Currently, buyers have been paying about $114 per square foot in Killearn Lakes, while buyers are paying about $135 per square foot in Southwood. Before you draw any conclusions on the resale market however, I would urge you to check into our recent posts on each neighborhood. We segment the data into new construction versus resale, and arms length home sales versus distressed property sales. Southwood has much more new construction being sold, so the values above are not necessarily indicative of what an existing home sale would fetch. I hope this satisfies those that wanted to see these two full neighborhoods compared, please drop me a note anytime if you want to know something specific about home sales in Tallahassee.